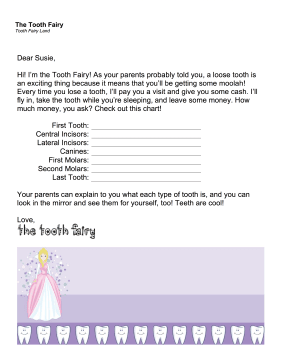 Be upfront with a child about the going rate of their different teeth with this printable letter from the tooth fairy. Hi! I'm the Tooth Fairy! As your parents probably told you, a loose tooth is an exciting thing because it means that you'll be getting some moolah! Every time you lose a tooth, I'll pay you a visit and give you some cash. I'll fly in, take the tooth while you're sleeping, and leave some money. How much money, you ask? Check out this chart! Your parents can explain to you what each type of tooth is, and you can look in the mirror and see them for yourself, too! Teeth are cool!